Literally meaning “peasant fries”, Kirli Kizartmasi is a local dish from Aydin province in the Aegean region of Turkey. 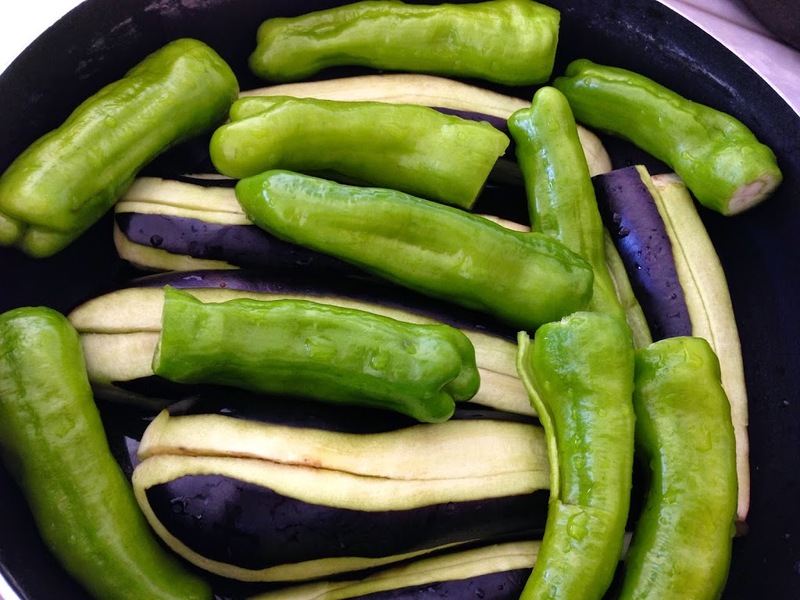 It is traditionally made with summer vegetables first fried in olive oil and then simmered in a pot to blend all the tastes together. Once I tasted a healthy version of this at my friend Ayla’s house, I was not going back to frying, since it was absolutely delicious. The trick was to let it simmer for about an hour and a half to two hours over very low heat. Wash and dry the eggplants. 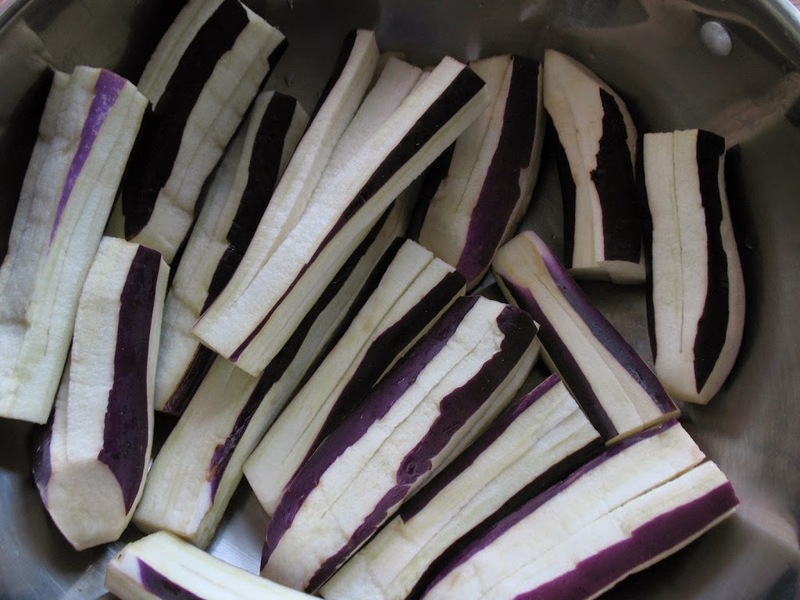 Remove tops, peel eggplants lengthwise in stripes (see the picture below). Starting at the non-stem end, cut it lengthwise until about 1 1/2 inches from the stem. Do not cut all the way through. Make another cut lengthwise at 90 degrees to the first cut. Place eggplants on the bottom of a large port. 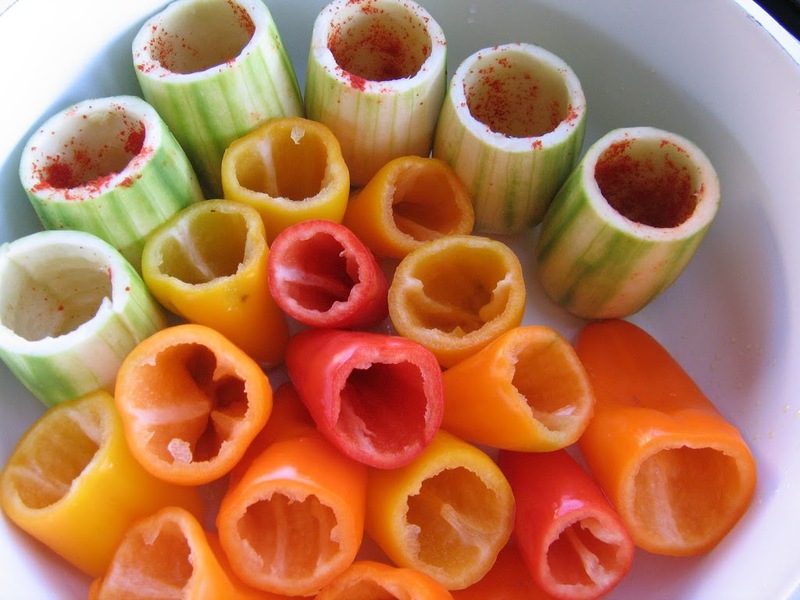 Wash peppers, remove stems and seeds from inside. 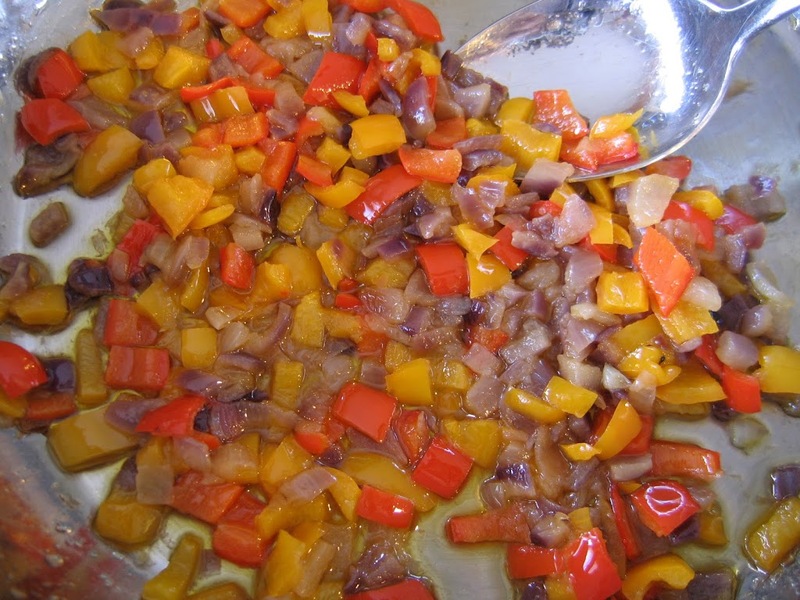 Cut the peppers lengthwise into about 1/2 inch thick strips. Put the pepper strips over the eggplants as the second layer. 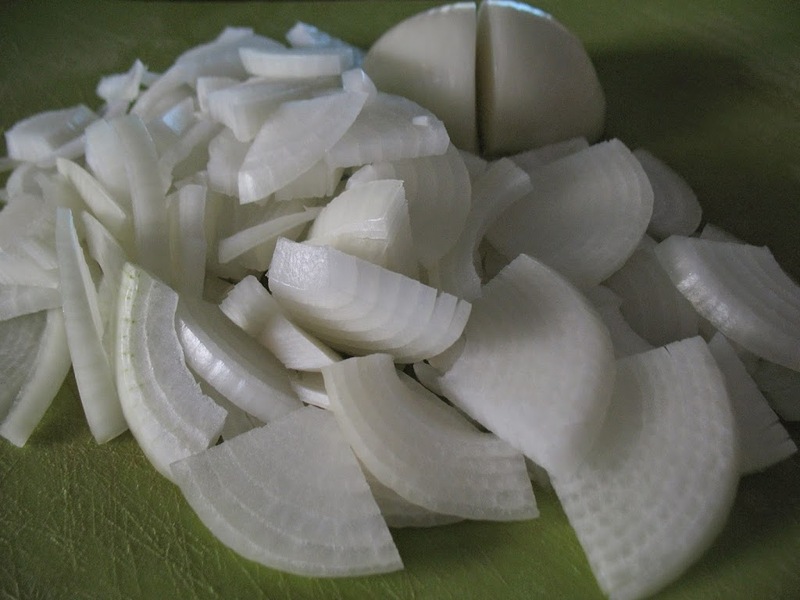 Peel and cut the onions in half. Then cut each half into 1/8 inch thick slices. Place onions over the peppers. 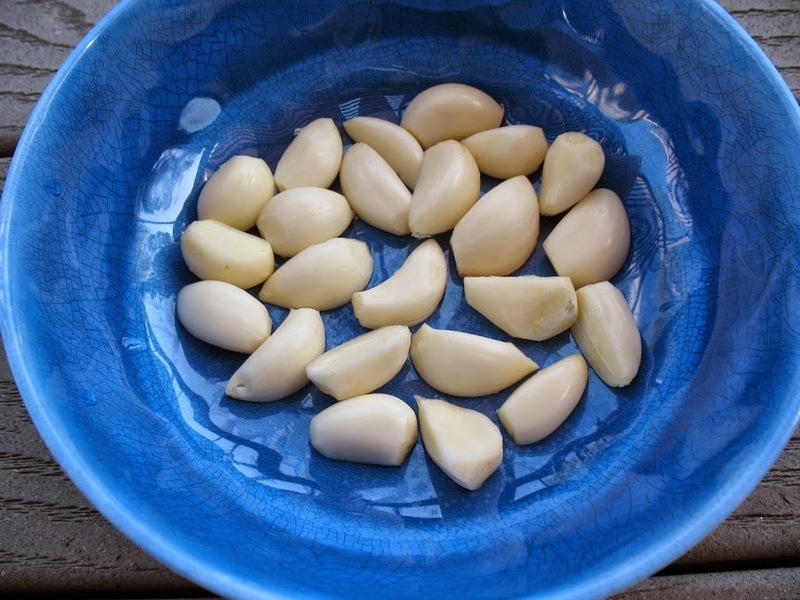 Peel garlic cloves. If the cloves a very big, cut them in half. 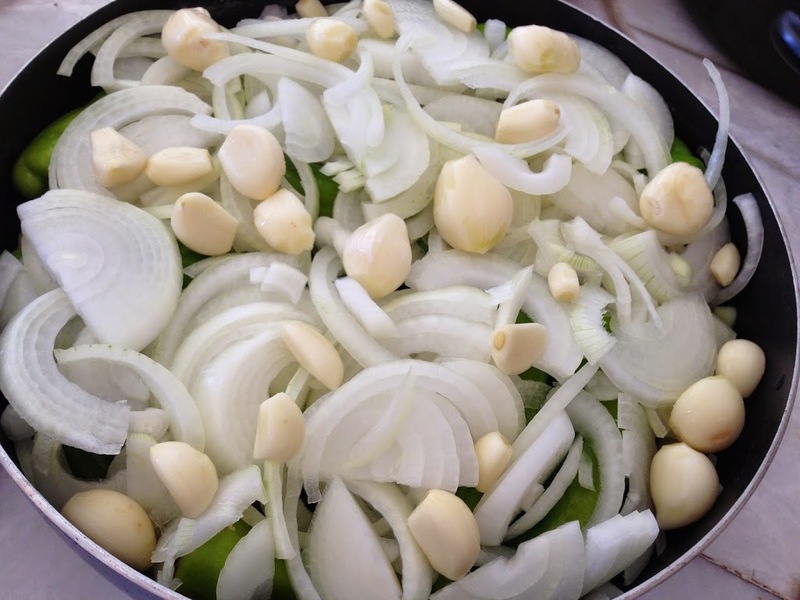 Place garlic cloves evenly on the top. Wash and peel the tomatoes. 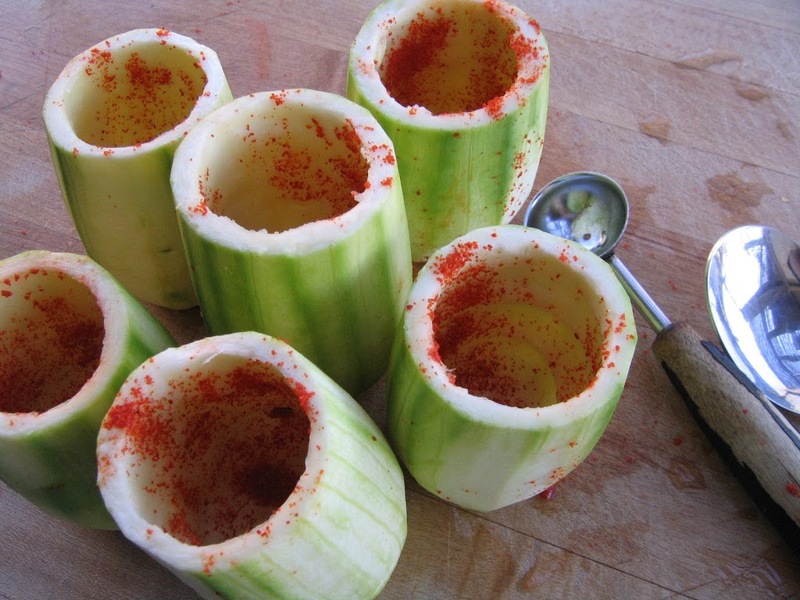 Cut them in quarters, then slice each piece into 1/4 inch slices. 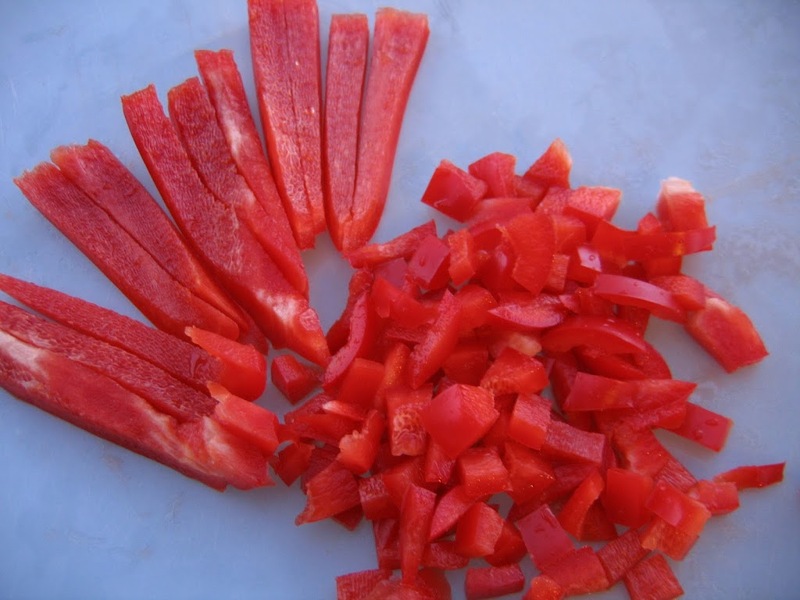 Place tomato slices over all the vegetables evenly. 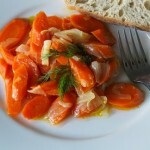 Drizzle olive oil over the layers of vegetables. 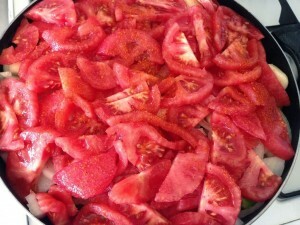 Then sprinkle salt and pepper over the tomatoes. Turn on the heat to medium. Once it starts to simmer, lower the heat to very low and let it simmer for about an hour and a half to two hours. You won’t need to add any water to the pot since it will simmer in vegetables’ own juices. However, if you are in a hurry, you can add a cup of boiling water and simmer on medium heat. It takes about 20 minutes to cook. Check to see if the vegetables are very tender. Once it is cooked, remove from the heat. Transfer to a serving dish. 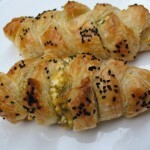 It can be eaten hot or at room temperature. 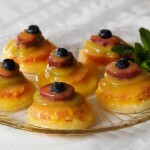 Can be served with plain yogurt on the side (optional). 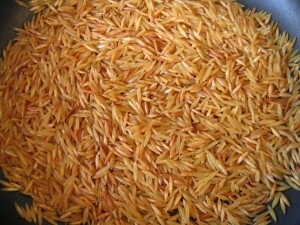 Orzo is most commonly used in soups in Turkish Cuisine. 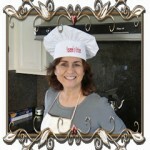 Growing up, when we had a cold, mom used to make chicken soup with orzo, it always made you feel better. 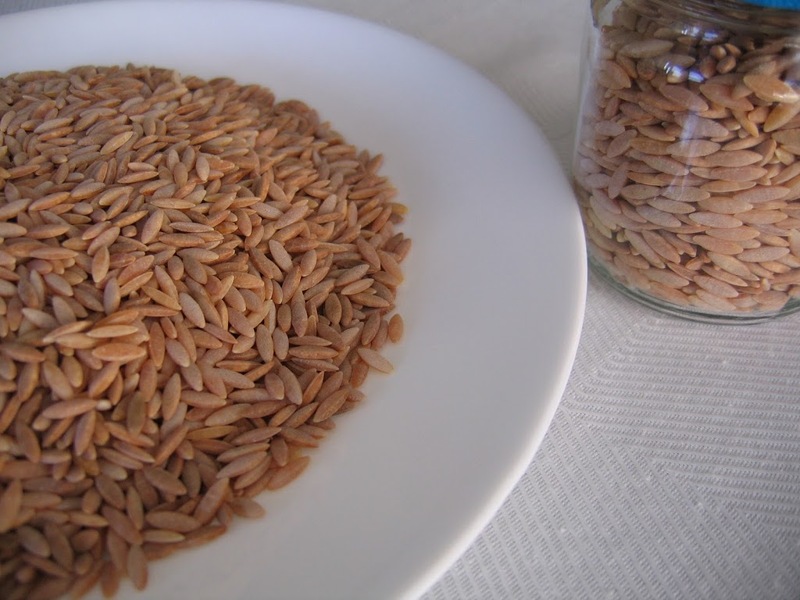 It makes a pretty good pilaf, but you need to roast it before you cook the pilaf. Otherwise, it would be like a sticky pasta. 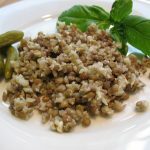 This version has bellpeppers and onions to add flavor, but you can get creative and add pine nuts, garbanzo beans and other cooked vegetables to spice it up. 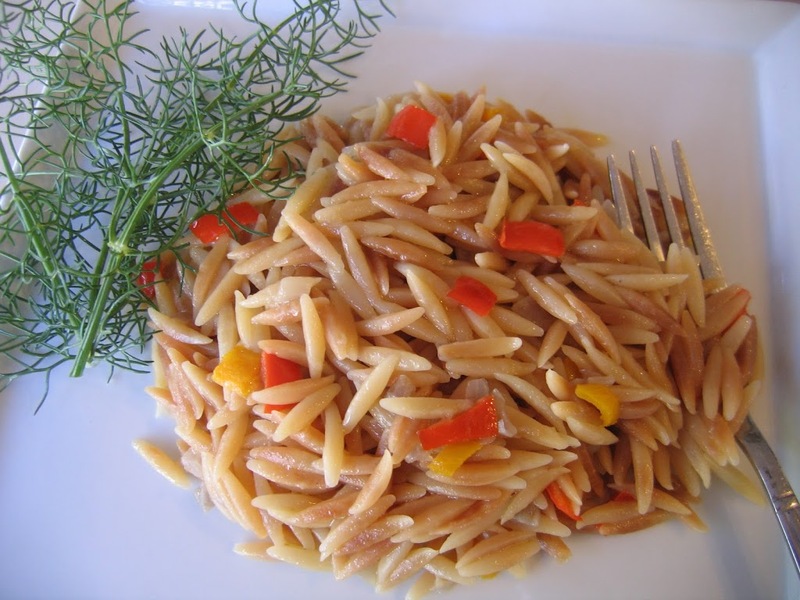 Place orzo in a large pan. 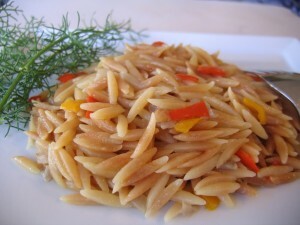 Over medium heat, roast the orzo until it is golden brown. I usually roast the whole package of orzo (about 3 cups). I use some and I save the rest in a jar to use it as garnish when cooking regular white rice pilafs.Chop onions and bellpeppers. You can use red ones or a mix of different color bellpeppers. 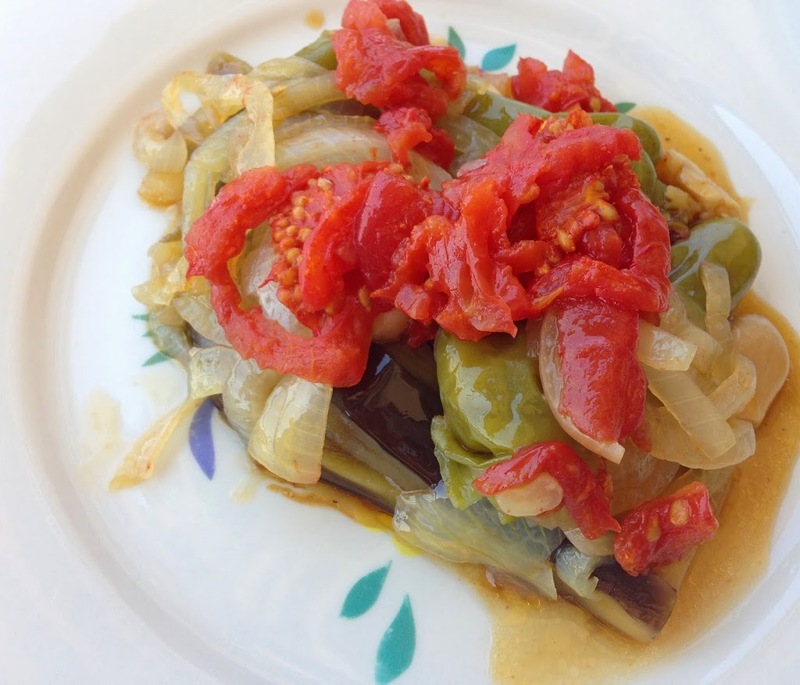 Combine olive oil, onions and bell peppers in a pan. Sauté until onions are golden brown, set aside. Place orzo in a large pan. 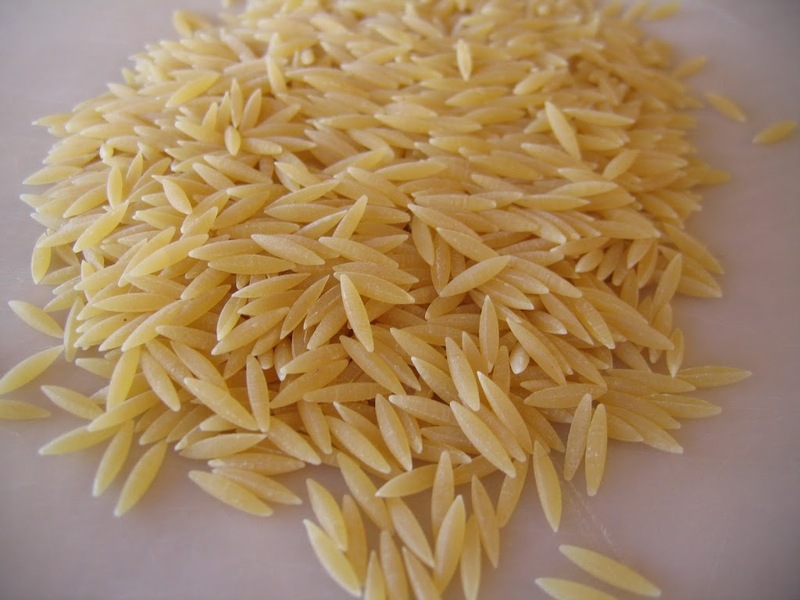 Over medium heat, roast the orzo until it is golden brown. 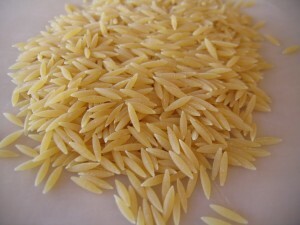 I usually roast the whole package of orzo (about 3 cups). 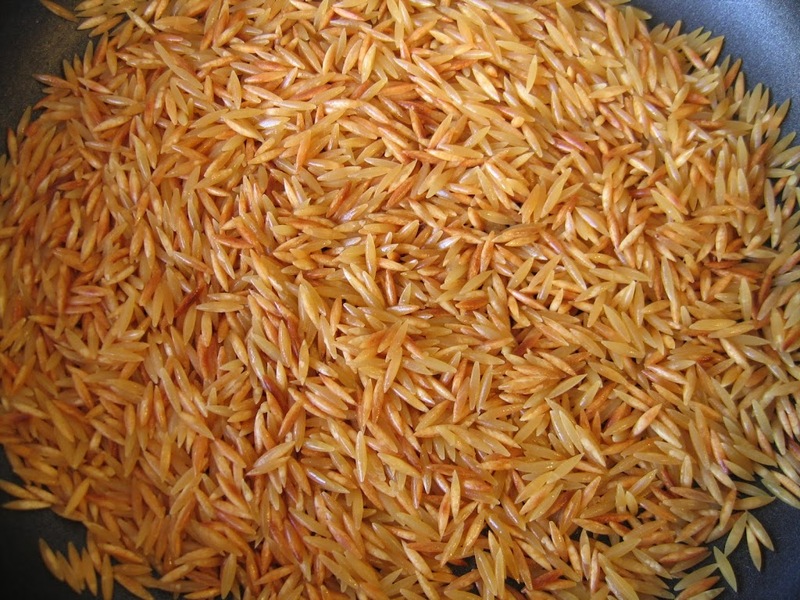 I use some and I save the rest in a jar to use it as garnish for regular white rice pilafs.Add 2 cups of chicken broth or boiling water, sautéed onions and bell peppers, salt and pepper. When it starts to boil, lower the heat to low, place lid over the pot, and let it simmer until orzo is cooked. Transfer to a serving dish. Serve hot. Save the unused portion of orzo in a jar for future use. 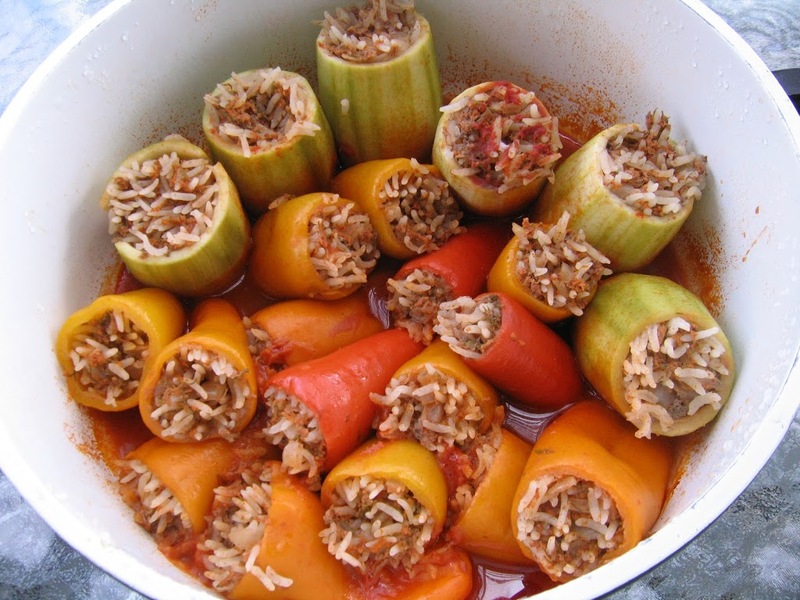 Dolma means “stuffed” in Turkish, referring to stuffed vegetable dishes. Best known dolma by far is the stuffed grape leaves. 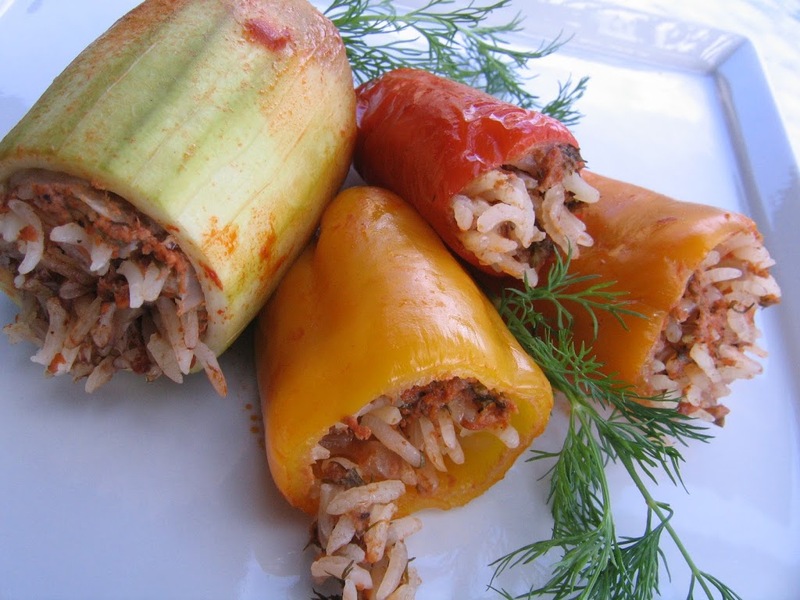 Other vegetables that are used in making dolma are peppers, eggplants, zucchini, tomatoes, cabbage, Swiss chards and onions. There are two versions of dolma. One with meat filling, other meatless. 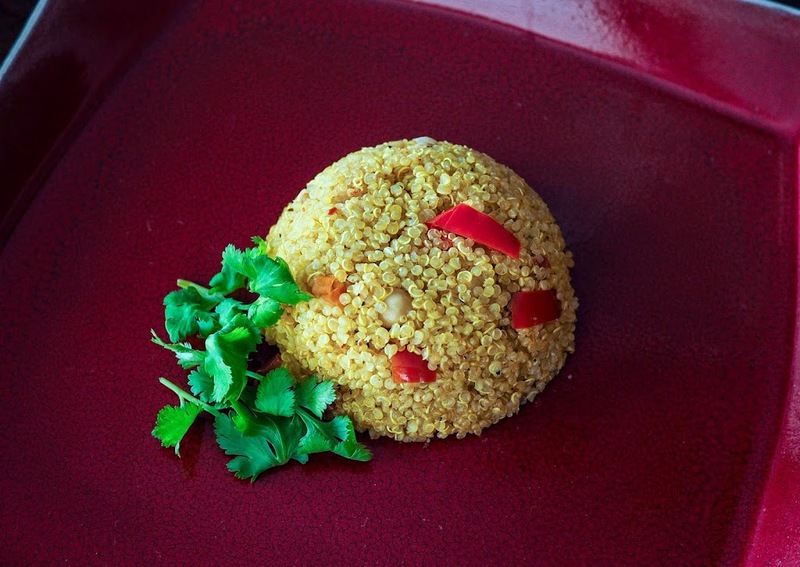 Both are made with a grain like rice or bulgur, onions and different herbs and spices depending on the version. Recipe below is made with ground beef and rice. 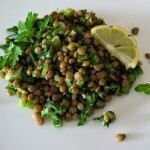 Meatless recipe to follow at a later time. Dolma is great comfort food, tasty and satisfying. 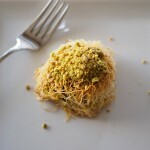 Like many Turkish dishes, it is usually served with yogurt on the side. Cut the tops of the peppers, remove seeds, wash, set in a pot. Peel and wash the zucchinis. Cut the top 1/3 of the zucchinis. 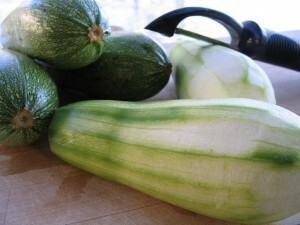 Using a melon baller and a small tea spoon, remove the inside of the bottom parts of the zucchinis (see picture). Save the top portions and the pieces that come from the inside. 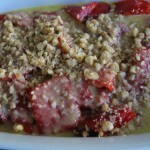 You can make zucchini dip (see recipe dated Feb 20,2012) using the leftover zucchini pieces. 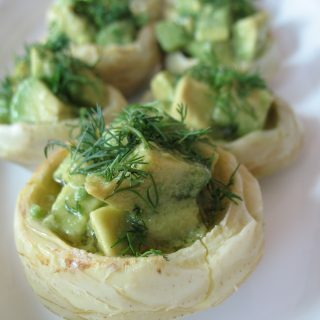 Sprinkle paprika inside the zucchini shells. Set them also inside the cooking pot. 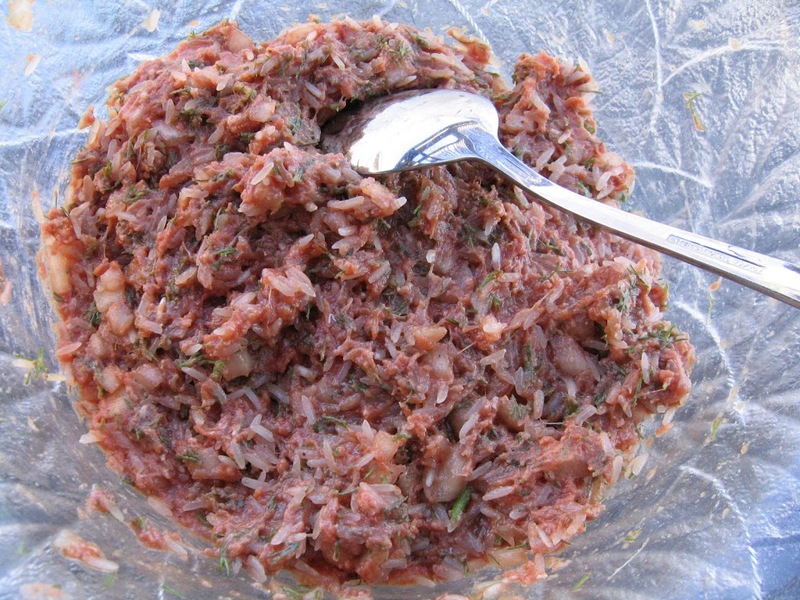 In a bowl, place ground beef, rice, onions, dill, olive oil, salt & pepper. Mix well with a spoon. 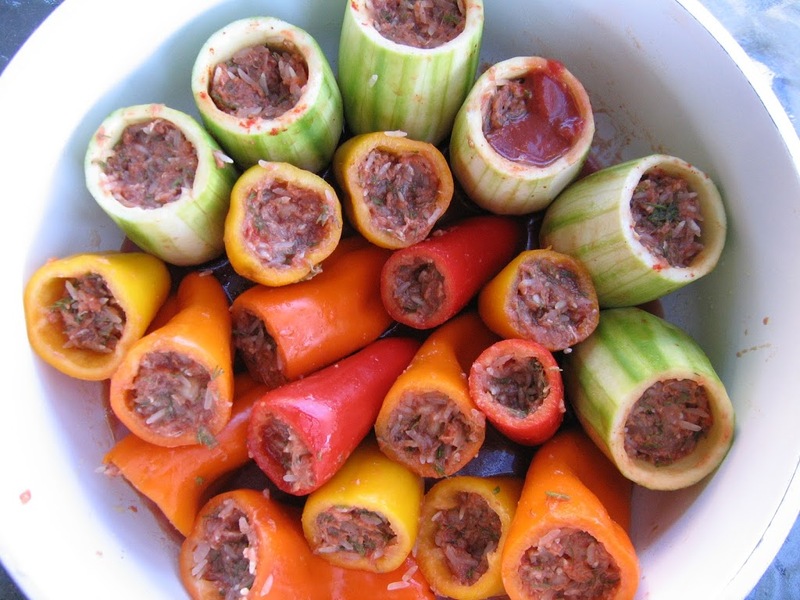 Fill the peppers and the zucchini with the filling. 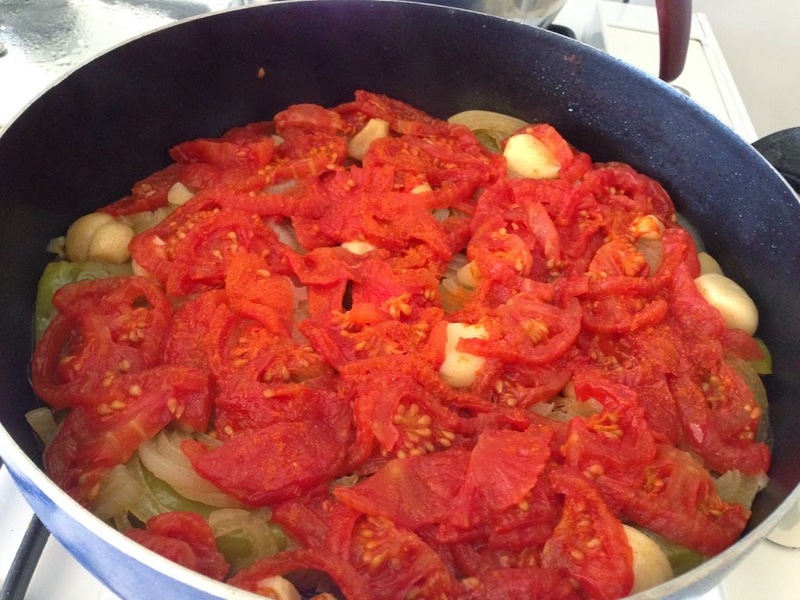 In a separate bowl, mix the tomato paste with boiling water. Add this sauce to the pot. DO NOT pour it over the stuffed vegetables, Gently pour from the side, letting the sauce go to the bottom of the pot. Otherwise the dolmas may get mushy. Start cooking over medium heat. When the sauce starts to boil, reduce heat to slow. Let it simmer until the rice is cooked and the peppers are tender, about 30-45 minutes. 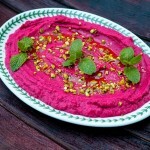 Serve hot with yogurt on the side or with salad. 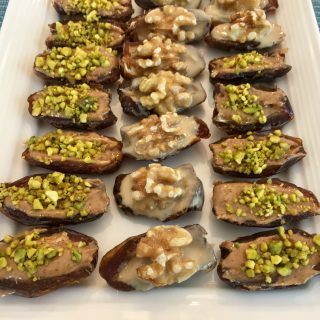 As I mentioned before, there’s supposed to be 41 different eggplant dishes in Turkish cuisine. This is one of the simplest ones. 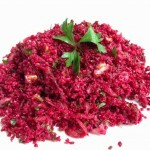 Though it is simple, I think it is very good as a side dish. 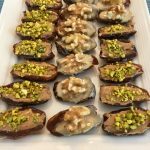 You can use any kind of eggplants for this dish, but I usually buy long Chinese/Japanese type eggplants since they have less seeds in them. Also, it is customary to add a teaspoon of sugar to most of the olive oil based dishes in Turkey, I leave it as “optional” depending on your taste. 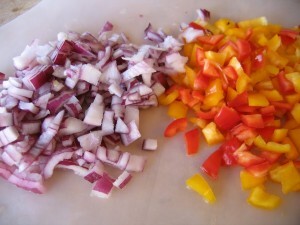 1 bell pepper or 1 cup frozen cut bellpeppers. Sometimes I use frozen peppers that come in 3 different colors. This adds a nice color to the dish. Cut the top of the eggplants. Peel portions of it lengthwise as seen in the picture below. Wash and drain. Cut them in byte size pieces. 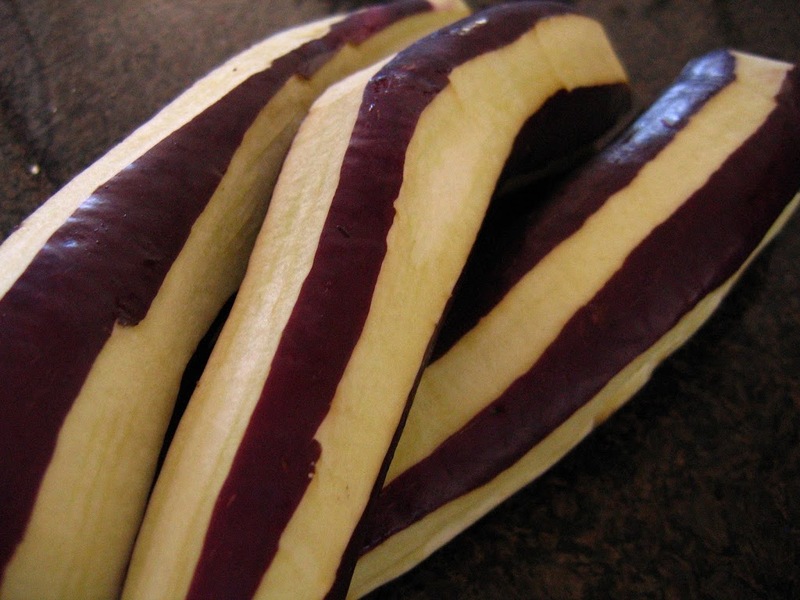 I usually quarter the eggplant lengthwise and cut into 1 inch slices after that. If you are using fresh peppers, cut the top of the bell pepper, remove the seeds. Cut in slices lengthwise. Wash and drain. 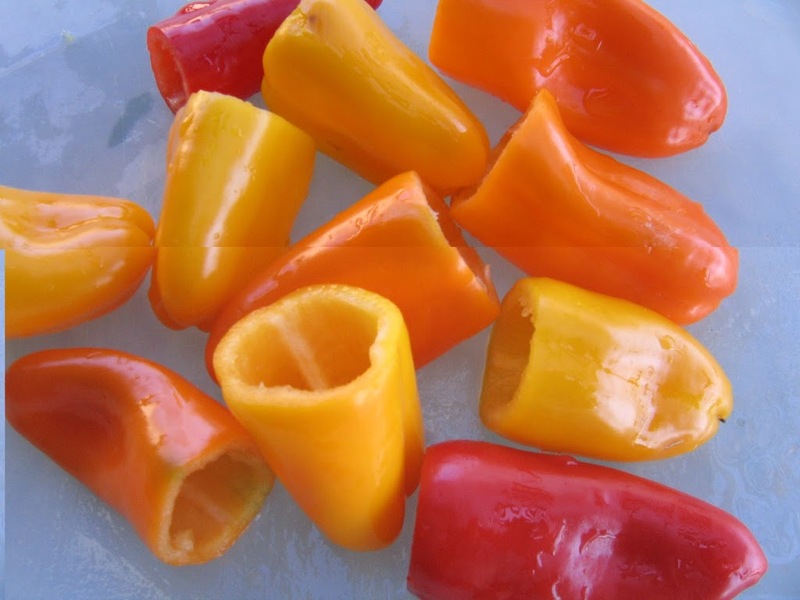 Skip this step if you are using frozen cut peppers. 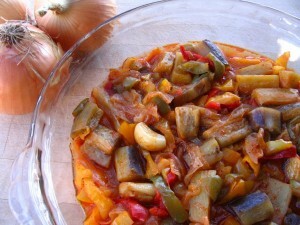 Place olive oil, onions and garlic in a heavy sauce pan. Sauté for 2-3 minutes over medium heat. In a small bowl, mix tomato paste and boiling water. 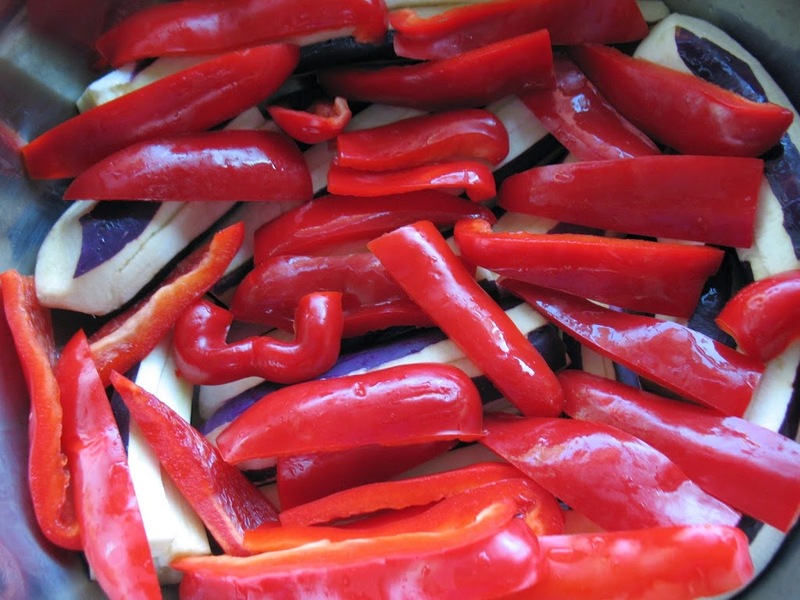 Add eggplants, peppers, tomato paste mixture, sugar (optional) and salt. Bring to a boil over medium heat, then reduce the heat to low. Simmer until vegetables are tender, about 15-20 minutes. Remove from heat. Transfer into a serving dish. 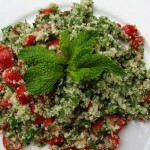 This is served at room temperature as most olive oil based dishes. 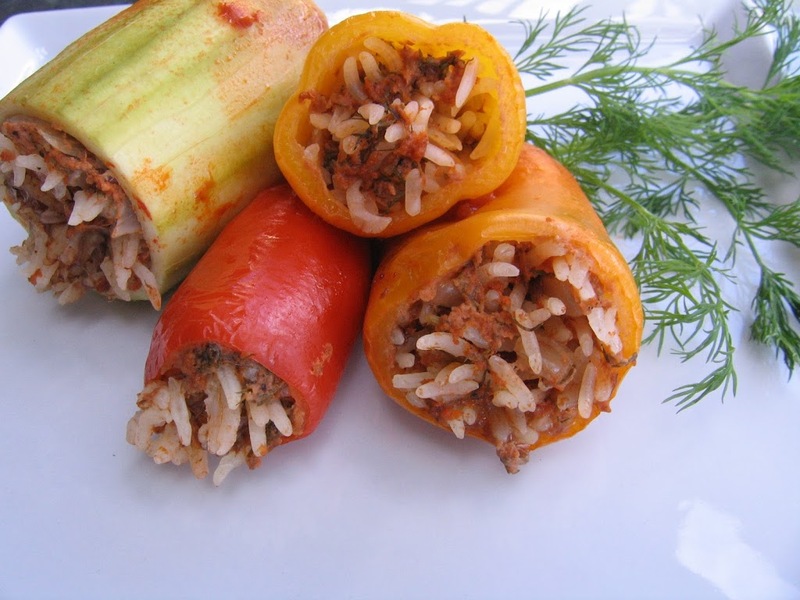 In the Aegean region of Turkey it is often a main dish for lunch, served hot with yogurt.